Introducing Billy and Smithee. Billy is an ex-mercenary & bounty hunter. Smithee is – who knows what he was, he can’t remember. But he seems to be at the center of the whole Zombie thing in some way.There is also a shadowy evil Dr. that designed the Zombies bent on destroying Smithee for him..
Don’t forget Rex the dog who is placed at strategic moments to comment on things. 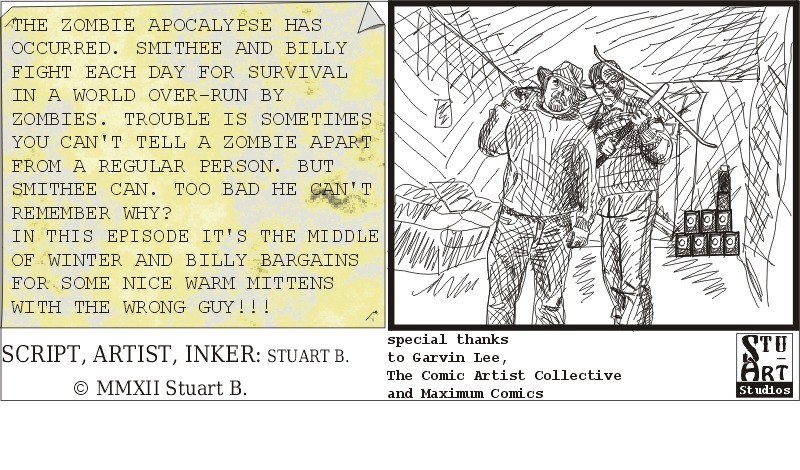 Together, maybe they can look out for each other, and just maybe someday bring an end to the Zombie nightmare! !